January 26th marked the last day of Artegon Marketplace opening its doors to the public. The attraction stood out on Orlando’s International Drive as a unique, “anti-mall” featuring small business vendors, art galleries, food trucks, and recreational games. Lightstone Group, the company that owns Artegon Marketplace, stated they planned on taking the property in a “new direction” after putting the property up for sale last August. Several vendors have had to rush to close up shop, while others are quickly finding new places to relocate their business. Owners of the popular comic book store Gods & Monsters, for example, has expressed their sadness over the closing mall as well as keeping their customers updated on new developments via Facebook. “We are being approached by dozens of awesome potential new spaces, wanting us to move in! So we don't expect to be down long, during this period of transition into a new home”, said store owners Anna Young and Todd Fisher. The Lightstone Group included on the Artegon Marketplace website that Bass Pro Shops, Ron Jon, Cinemark, Putting Edge, Fuddruckers and Sky Zone will remain open. 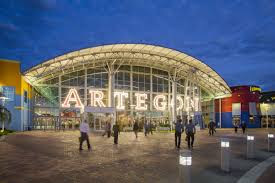 Many past patrons of Artegon are sad over its closing, as it was once a great place to shop and spend the day. This event goes to show that we should aim to support small businesses when we can, and hopefully the building will be put to good use for the Orlando community.